Majjige HuLi is most favorite to people of Bengaluru/ Mysoru. 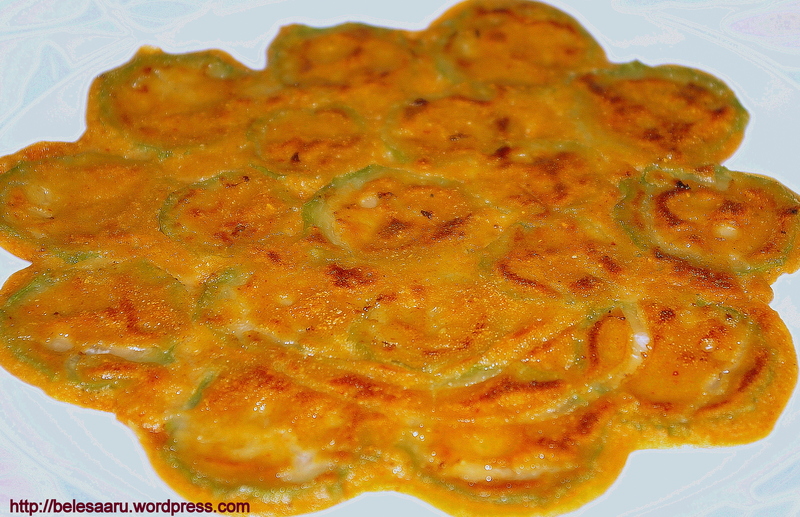 It is very tasty, simple, easy to prepare dish made of single vegetable with yogurt and gravy. It goes really well with rice, muddhe or nuchinunde. We can prepare this dish with a variety of vegetables, like bendekai/ okra, seemebadhnekai/Chayote, boodhkumbaLakai /Ash gourd, dantina soppu/Amaranthus , thondekai/Tindora. Today I prepared it with dantina soppu/Amaranthus. In a vessel, heat a glass of water and add the chopped leaves, let it cook for few minutes until tender (add little salt while the leaves are cooking). Meanwhile grind coconut, green chillies, coriander, ginger, turmeric, cumin seeds , 1/4 tsp of mustard seeds and channa dal with little water. Grind to a fine paste. Add the ground mixture to the cooked leaves. Cook till the raw smell goes away (approximately for 8- 10 minutes). Add the yogurt/majjige at the end and mix well. Add more salt if needed. For seasoning- Heat 2 tbsp of oil, add 1/2 tsp of mustard seeds and curry leaves. 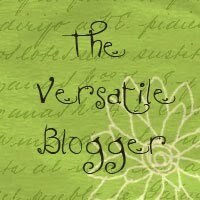 Allow the mustard seeds to splutter. Add the seasoning on top the majjige huLi and its ready to serve. Pizza brings back nostalgic memories to me. There is a chaat center in Malleshwaram 8th cross who sells not only amazing chaats but also delicious small pizzas. When I was in my college I used to go and have their pizzas almost every day and I also remember the pizza guy asking me if I ever eat anything other than pizza 🙂 and those pizzas were just 8 rupees back then now I am sure they must have increased the price. So thats how I was introduced to pizza and after coming to US my craving for pizzas have never ended. I love to try different ingredients on pizzas each time I bake one. My husband and I both like Greek pizza a lot. Artichokes are another favorite for us. So this time I tried using all these on one base and it made for a tasty pizza! In a bowl mix all the above ingredients well and the sauce should sit for 30 minutes to blend flavors. I took the pizza sauce recipe from all recipes.com and. I omitted few ingredients for my own taste. Cut tomato and onions into thin slices and grate mozzarella cheese. 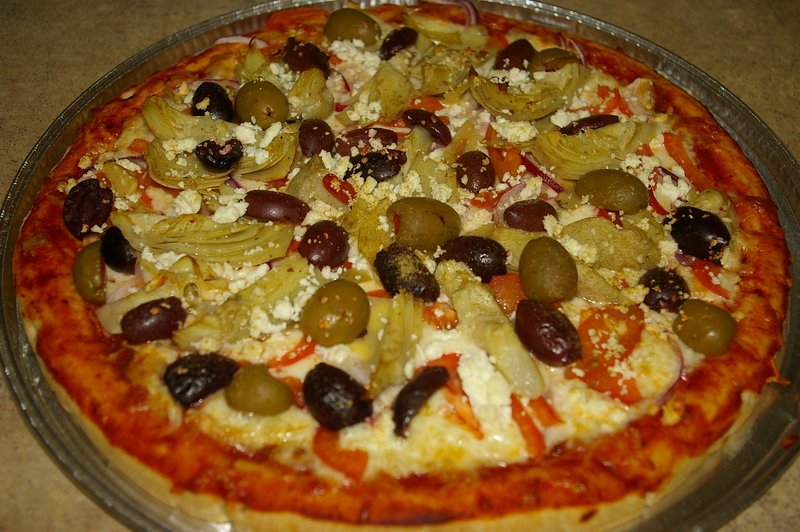 Cut the olives lengthwise into halves and artichokes into small bite sized pieces. 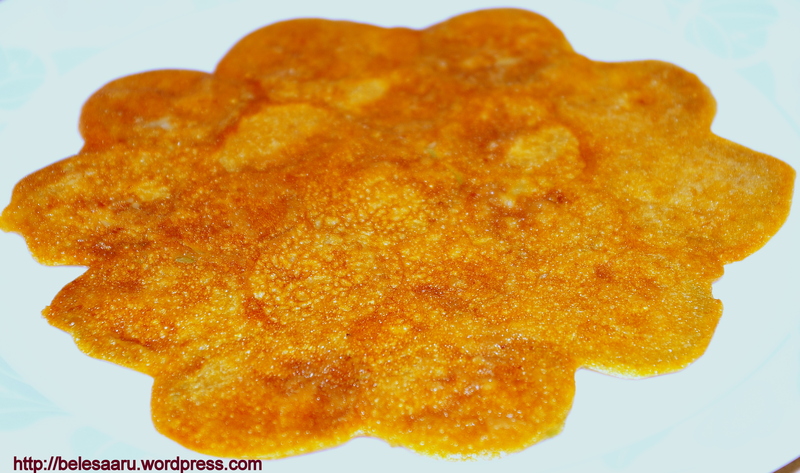 Coat a large pizza tray with cooking oil and sprinkle the corn meal. Place the pizza base on the sheet and evenly spread pizza sauce, shredded mozzarella, artichoke hearts, tomato slices, onion slices, olives, feta cheese. Sprinkle oregano on top. Place in the oven and bake for 15-18 minutes or until it is cooked. Remove from oven and slice. Enjoy! 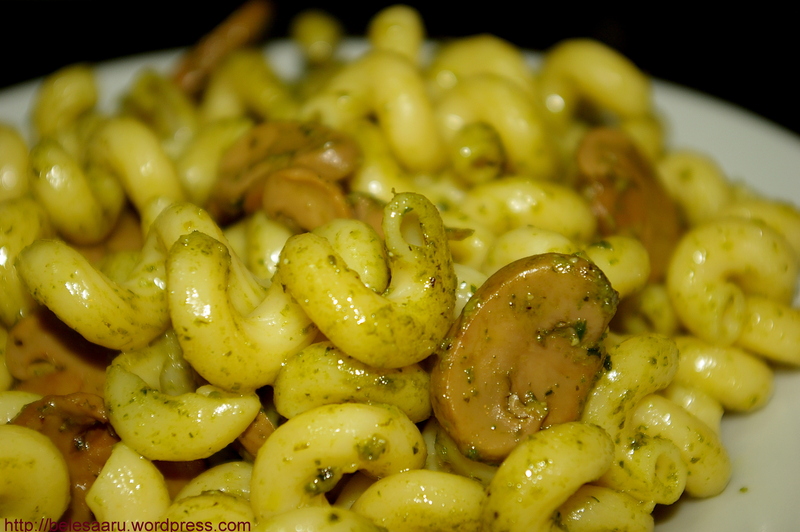 I can never forget having pesto pasta the first time at an Italian bistro, the flavors just hit me and the taste was so good. I could never guess the ingredients until I asked my husband. Then I did some research and found out that small variations in the sauce can ruin the flavors. Blend basil leaves and pine nuts coarsely in a food processor or blender. Add in olive oil slowly until it mixes well. Pour the sauce in a container and add the cheese and mix well. Add salt and pepper as per your need. 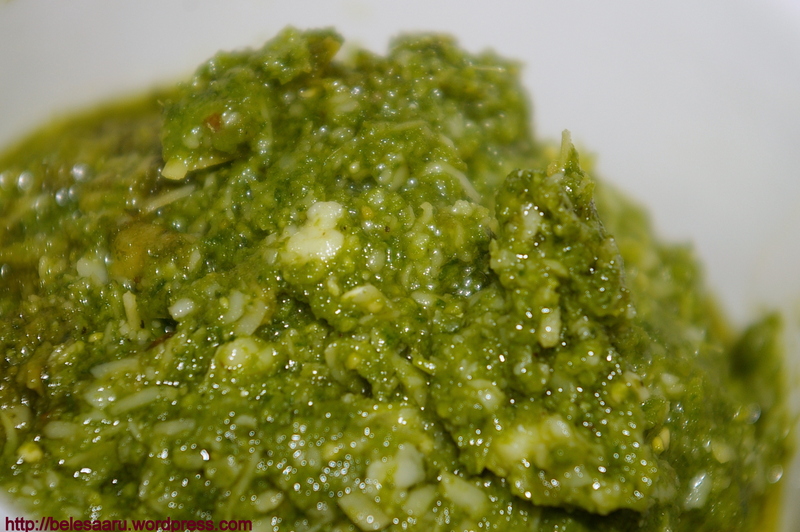 The pesto sauce can be stored as prepared for up to a week in the refrigerator. If you are planning to store the sauce for a longer time, store it without adding cheese. Apparently, if you top the sauce with olive oil and store it in the freezer, the sauce will be good up to three months. Cook the pasta as per the instructions given on the pack. Add mushrooms 5 minutes before the pasta is cooked. Drain and run cold water on the pasta to prevent it from sticking. 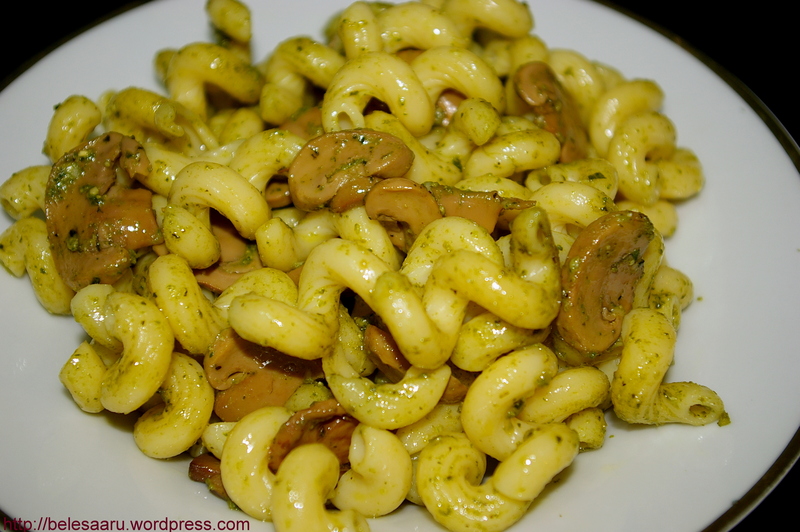 Heat 2 tsp of olive oil in a pan, add the pasta and mushrooms and stir well for few minutes. Add 2-3 tbsp of pesto sauce and mix well. Do not heat the pasta too long after adding the sauce. Mix well and serve immediately! Noodles are one amazing food. They come in so many different shapes and sizes and anything and everything can be added to them to make it flavorful. I had these Thai noodles in a food court the other day. It was so flavorful and tasty that I could guess every individual ingredient added to it, which made it really easy to make it! Mix all the above ingredients in a bowl and keep aside. Soak noodles in hot water for 8-10 minutes or until soft. Heat a wok or frying pan over medium high. Add 2 tbsp of oil, stir fry bok choy and spring onions until they turn dark green in color. Now add the noodles along with vegetable stock and stir fry for 2 minutes. 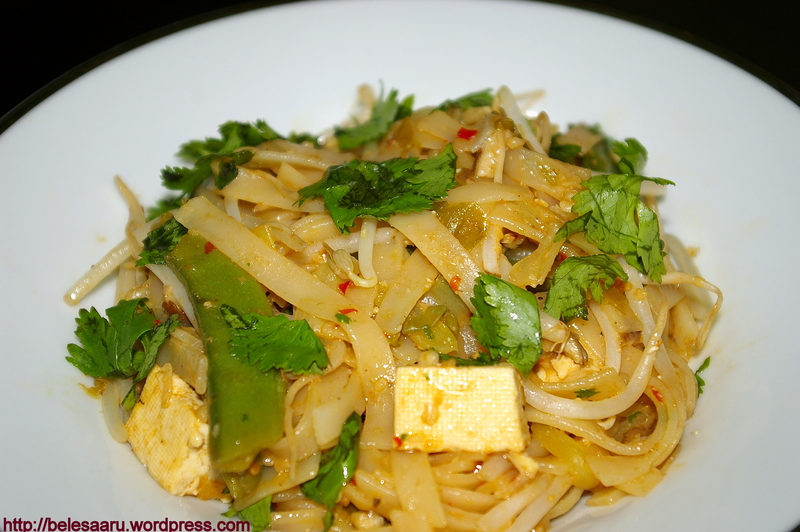 Mix tofu with the noodles and stir fry for 1-2 minutes. Add the sauce slowly and continue stir frying. 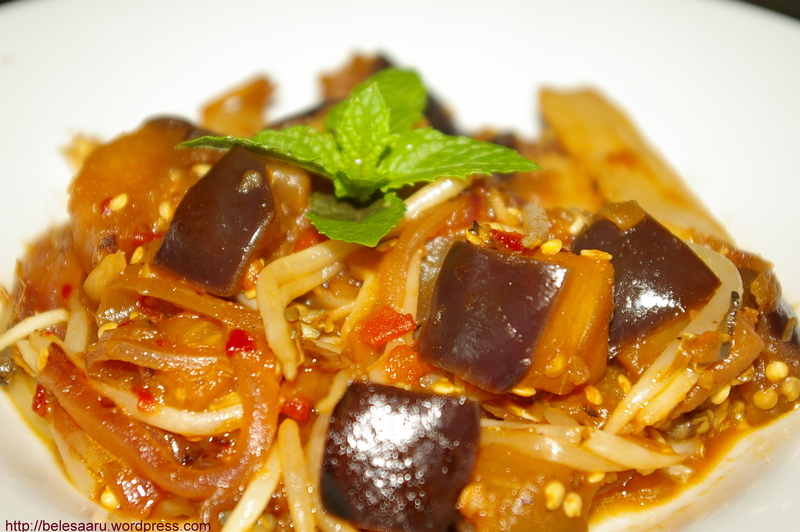 Toss the noodles well so that the sauce is evenly spread to noodles. Add extra sauce if required. Add bean sprouts, mix well. Noodles are cooked well when they are soft and become sticky. Remove from heat, sprinkle coarsely ground peanuts and garnish with coriander/cilantro. 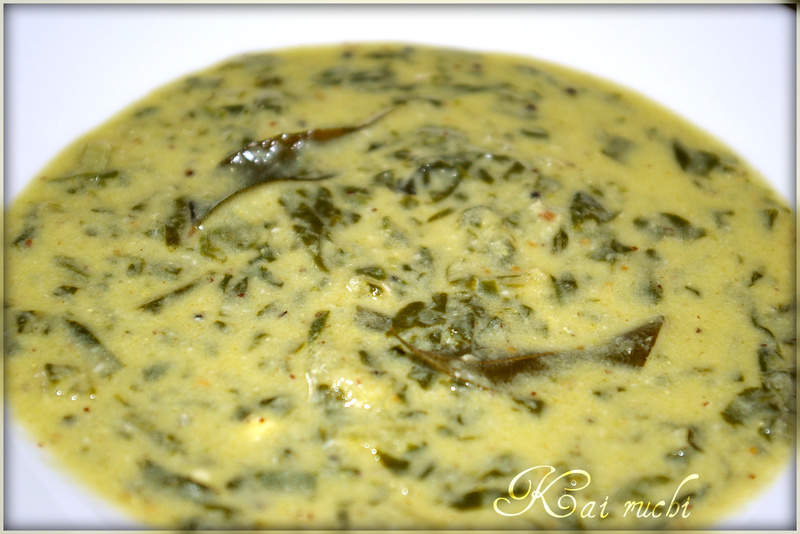 This is a very popular dish is south Karnataka, made of any or all types of greens. 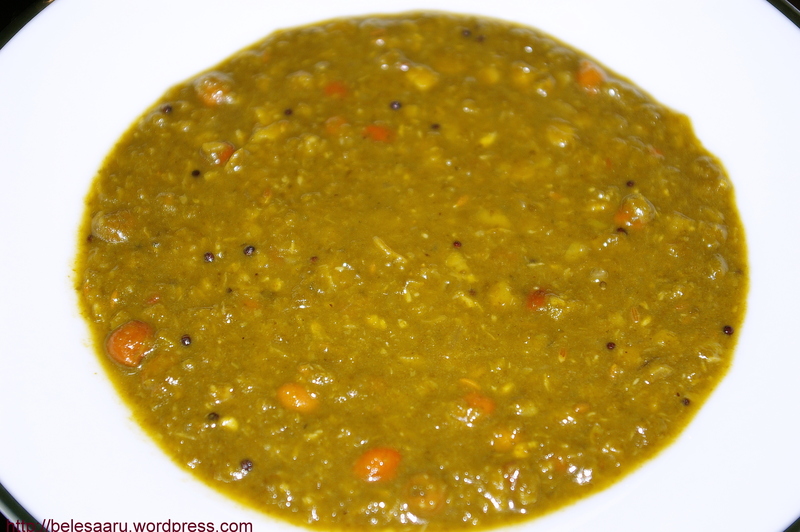 It is very nutritious and goes very well with rice or ragi mudde (millet balls). Other vegetables like onions, potatoes, brinjal (eggplant), and beans like black channa dal, avare kaaLu (available in Indian grocery stores as “surti lilva” or “papdi lilva”) can also be added. Pressure cook toovar dal and black channa dal and keep aside. Chop all the greens, onion green chillies and boil them with 2 cups of water for 10 minutes. Grind this boiled mixture with coconut and cumin seeds coarsely. Add the cooked lentils in a pan and mix the ground mixture. Add the tamarind paste and salt to taste. Bring the mixture to boil. Heat ghee in the seasoning pan, add mustard seeds allow the seeds to splutter, and then add red chillies and asafetida. Add the seasoning , mix well and serve with hot rice or ragi mudde.